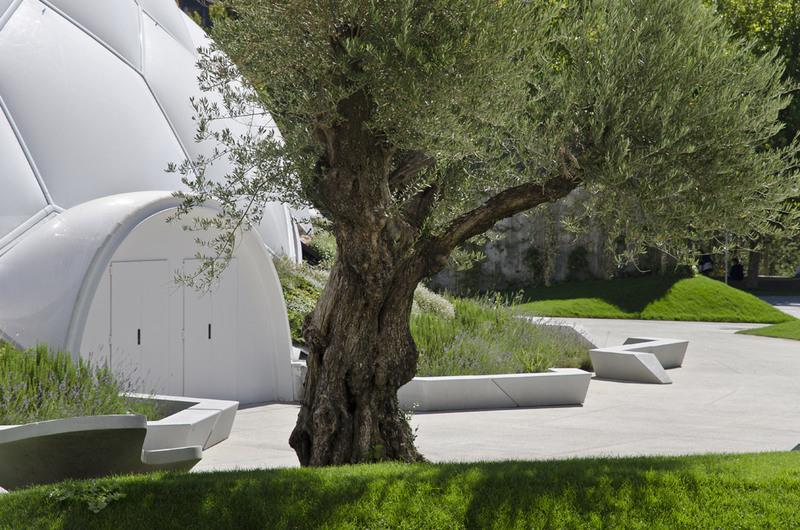 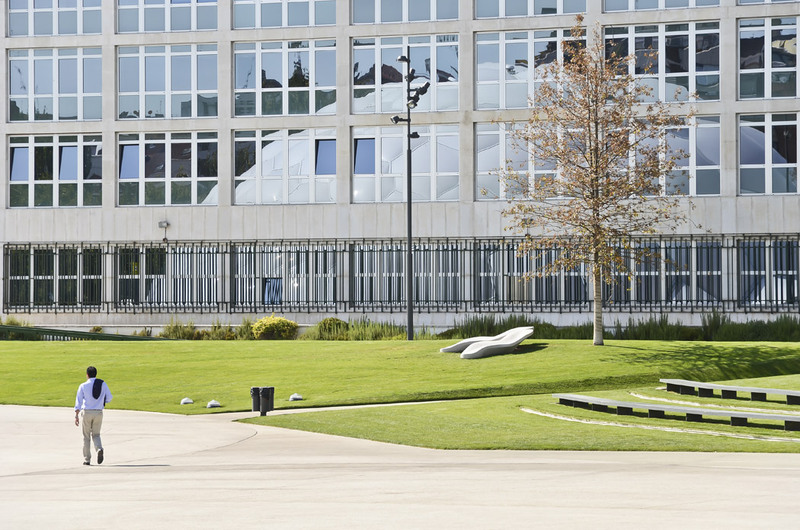 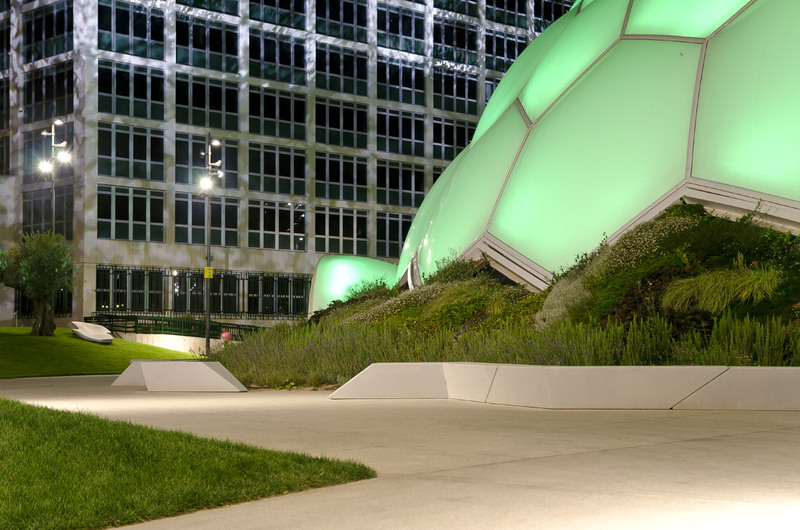 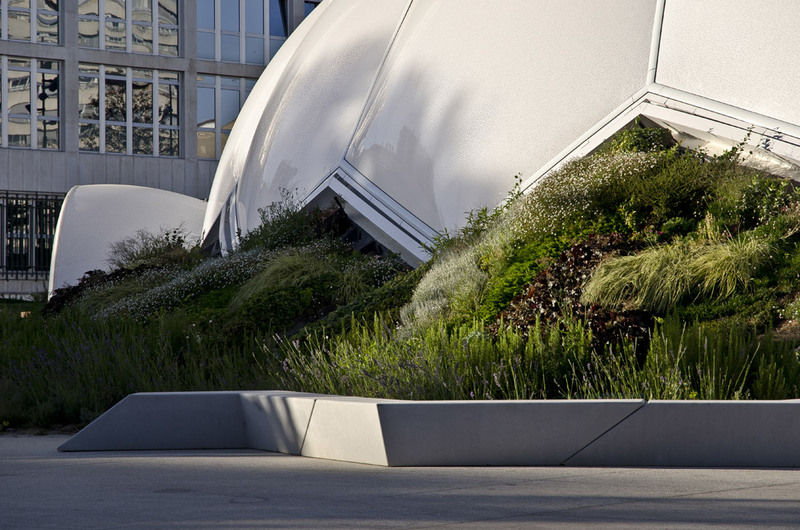 EXP ARCHITECTES: The project of urban redevelopment by EXP architects consists in renewing the square, with its new pavilion in the immediate environment, and providing for a multiuse structure which a capacity of 1500 persons. 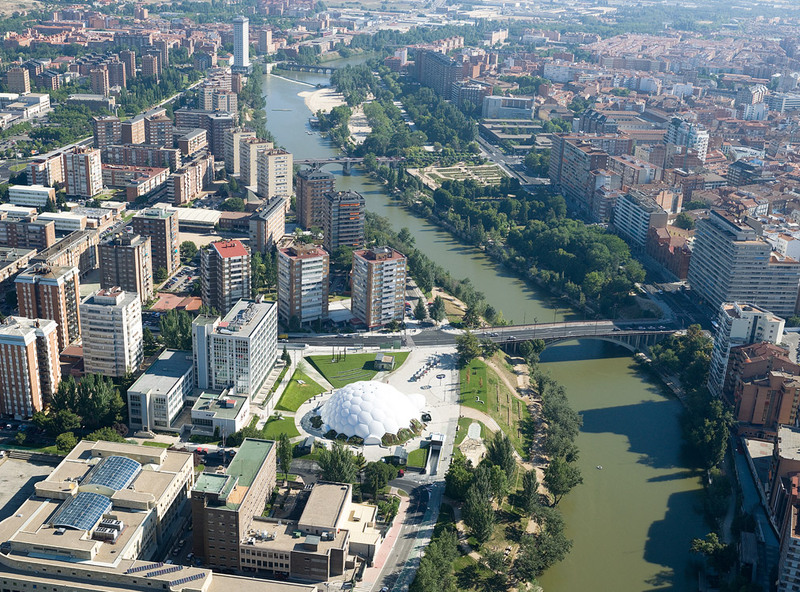 Valladolid, an historic city of 320 000 inhabitants, located in North West Spain, is the capital of the province of Castile and Leon. 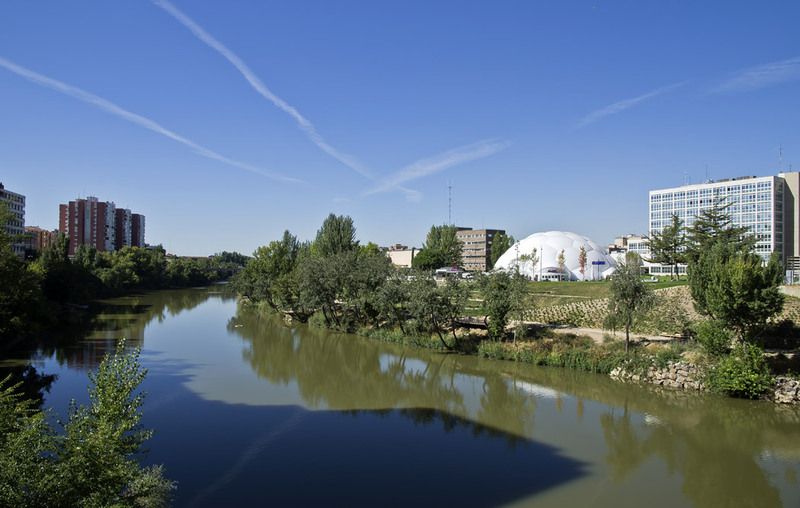 The city stands at the confluence of the Pisuerga and the Esgueva rivers. 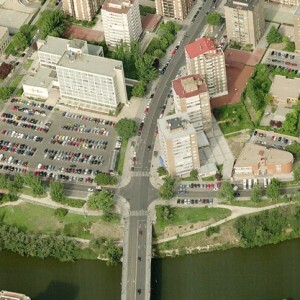 The district of the Plaza del Milenio borders the right bank of the Pisuerga and is connected to the historic center by the Isabel the Catholic Bridge. 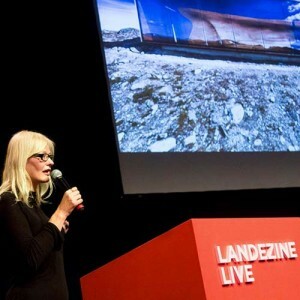 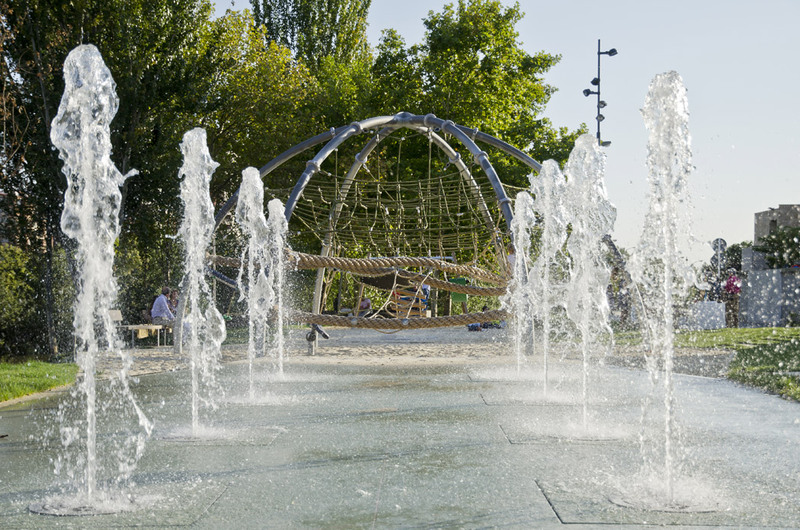 The project concerns the development of public spaces. 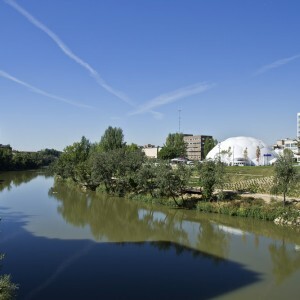 It consists in re-connecting the district with the city center and of enhancing the banks of the Pisuerga river. 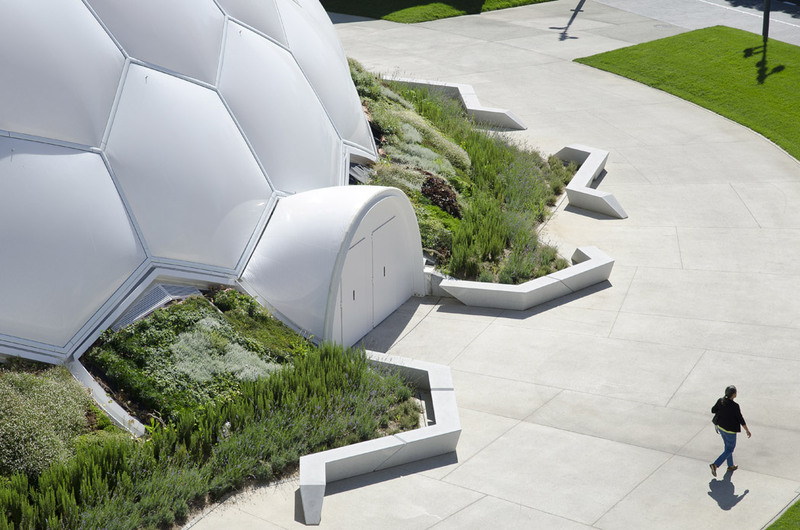 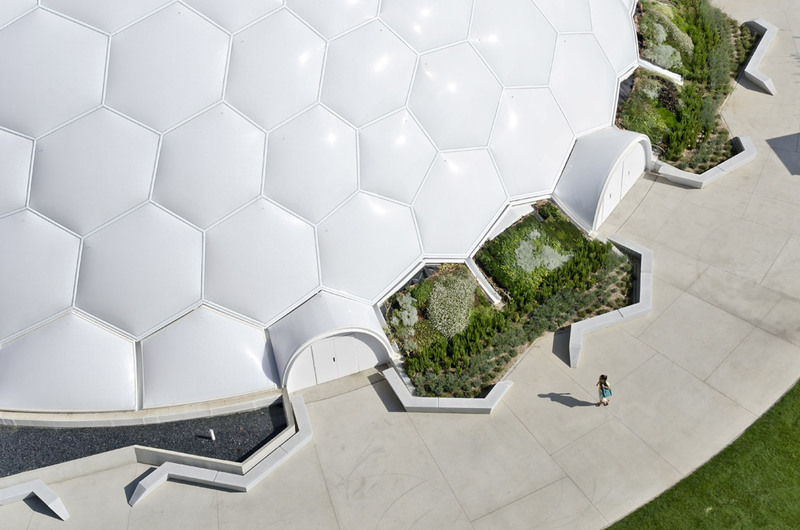 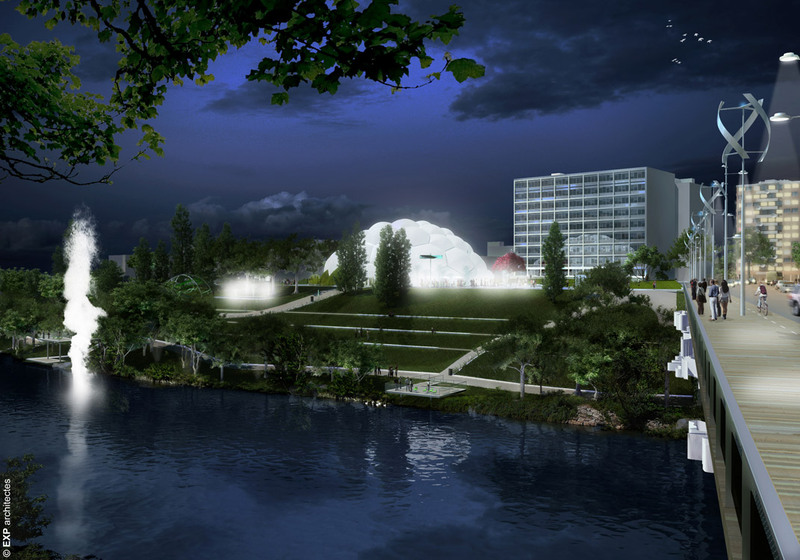 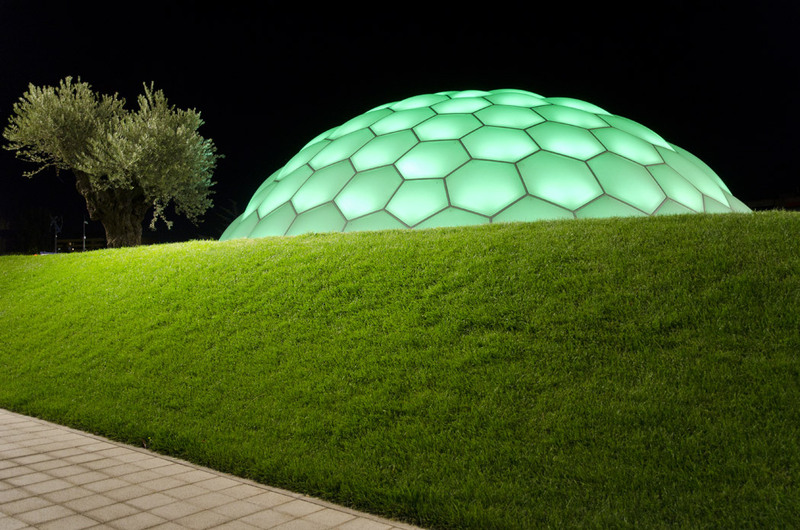 The project comprises several interlinked components: a car park, a pavilion dedicated to cultural events, a vast square, and an environmental reserve. 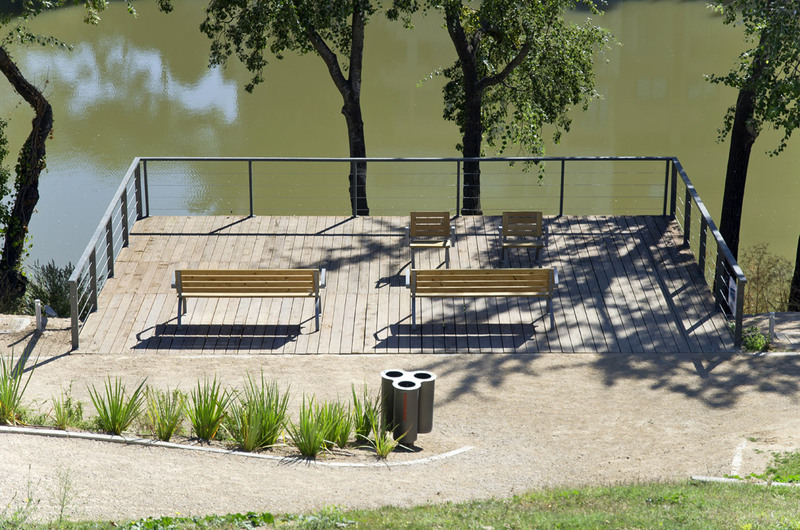 The project addresses the development of the area at every scale, from the street furniture to the landscape of the river itself. 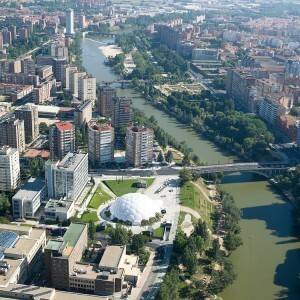 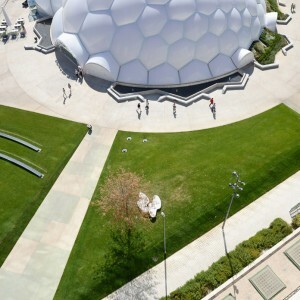 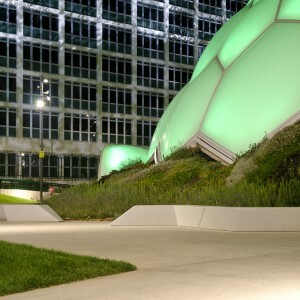 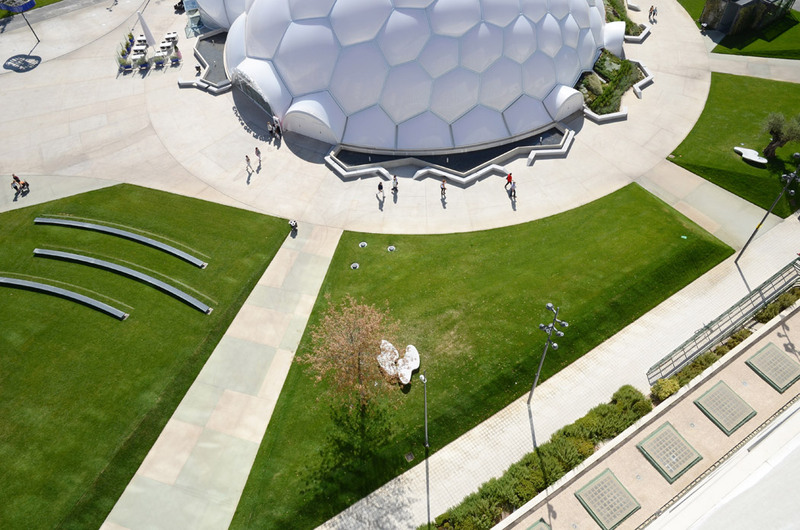 The various components are managed by different teams: the underground car-park containing up to 400 vehicles and energetic infrastructures (DAD arquitectura); the multifunction pavilion – initially conceived for the international exhibition of Saragossa and reused – (Cloud 9); the development of the public spaces, and of the urban park, and the requalification of the bridge (EXP architects & DAD arquitectura); completed with an urban scenography (Les Petits Français). 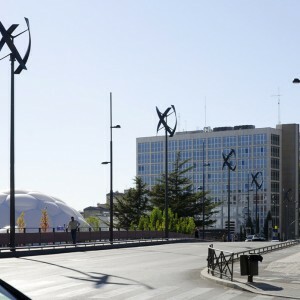 The team has developed a contextual intervention with objectives of sustainable development. 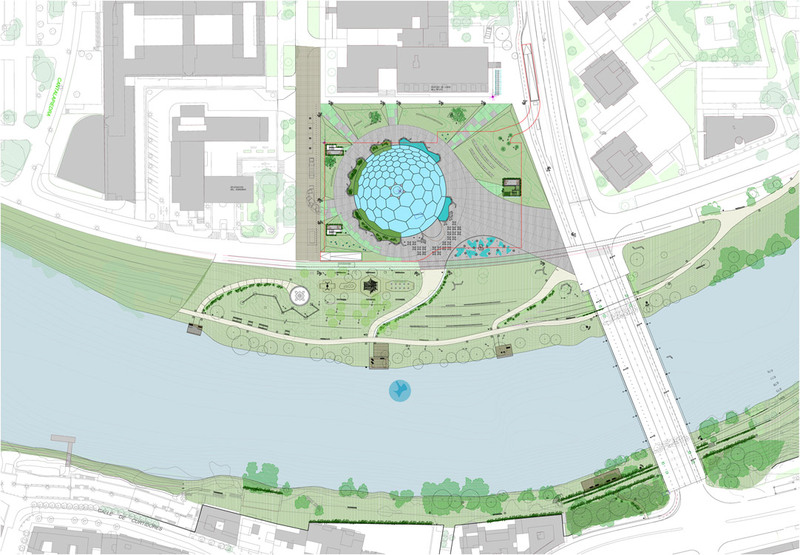 To extend the district beyond the bridge towards the city, the project is based on a progressive expansion of the ecosystem of the river towards the public space. 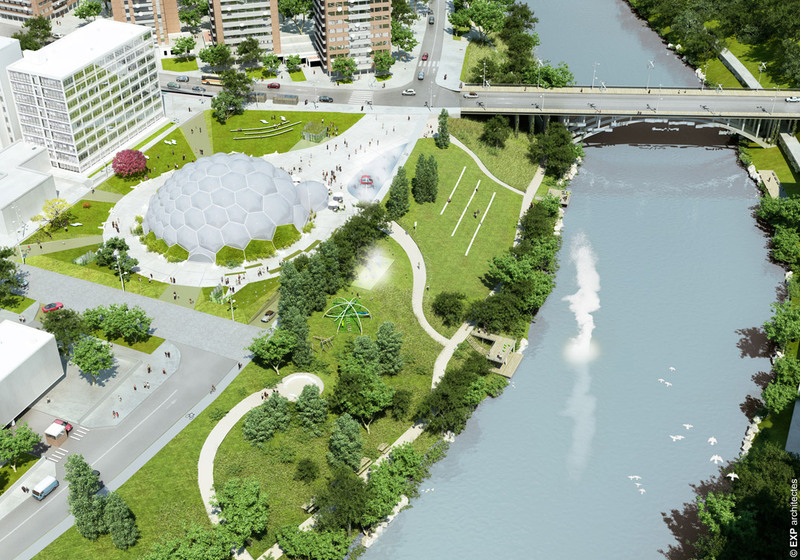 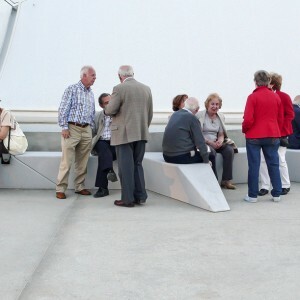 It places the pavilion at the very heart of a new green space connected to the city center thanks to the renovation of the Isabel the Catholic Bridge. 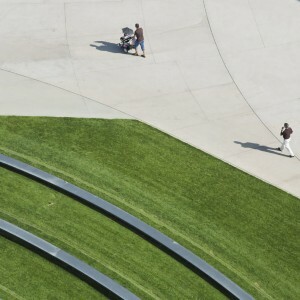 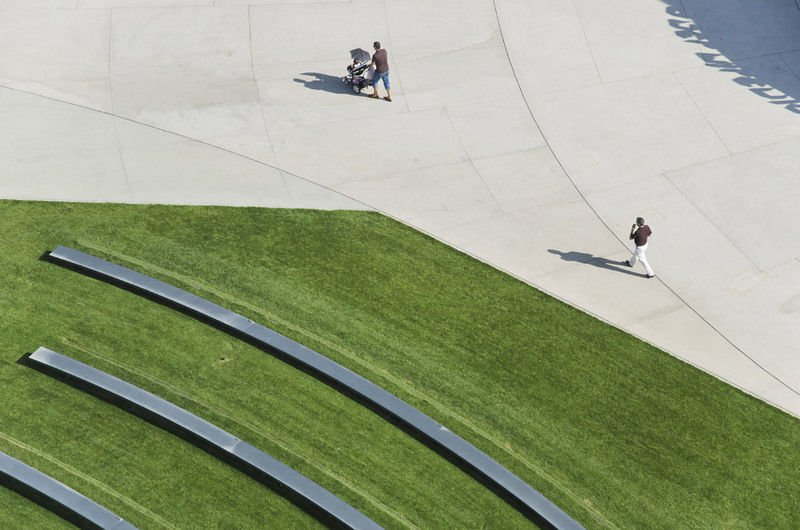 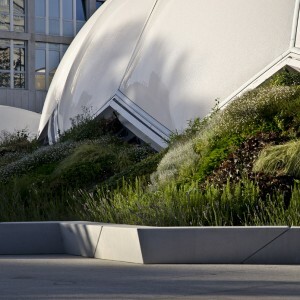 The ground of the square lifts up slightly, providing an artificial topography of turfed slopes in continuity with the movement of the banks, allowing the atmosphere of the river to migrate towards the urban space. 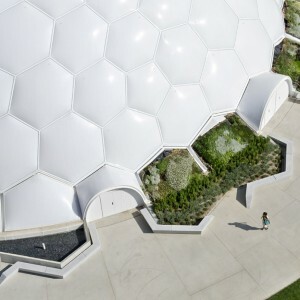 By a gradual passage from the vegetable to the mineral, nature is thus tamed, domesticated on the square and all around the pavilion through the creation of thematic gardens, water gardens, and the planting of remarkable trees. 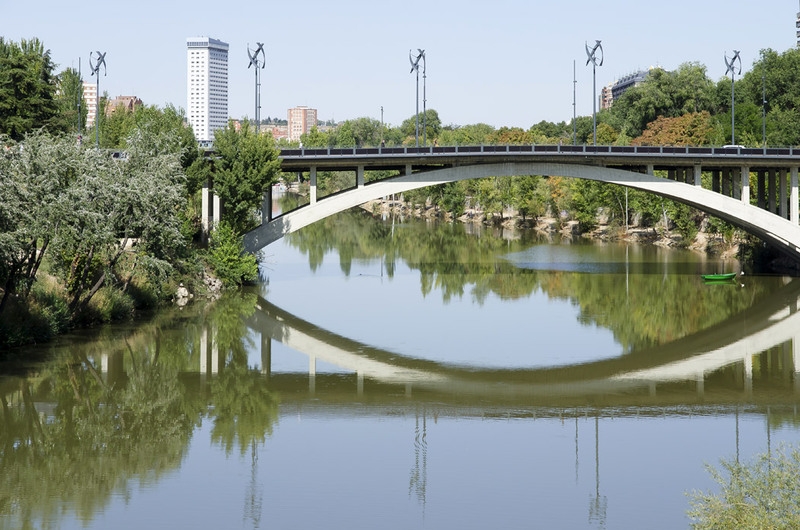 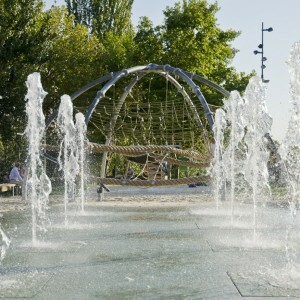 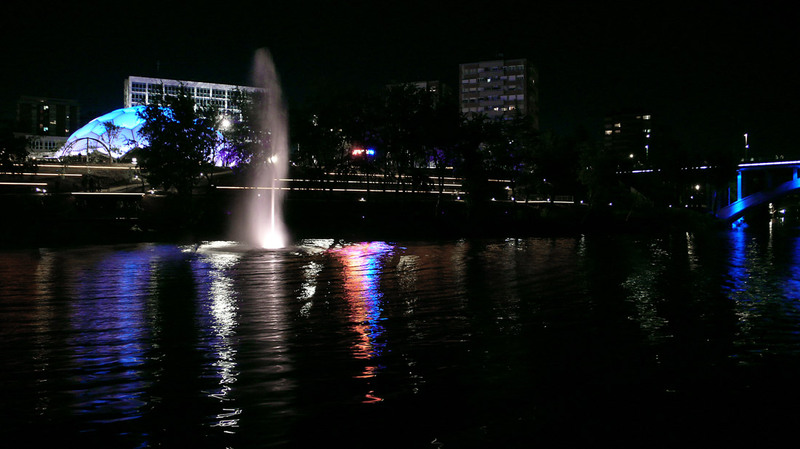 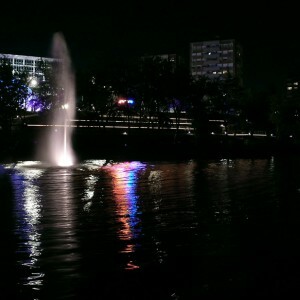 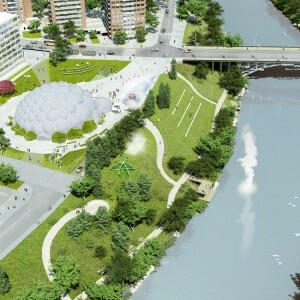 The banks of the river are treated as an urban park offering new assets: observation platforms at the water’s edge, collective and individual street furniture, interactive children’s games, mist generators and water fountains, scenic geysers, sculptures, and lighting highlighting contour lines. 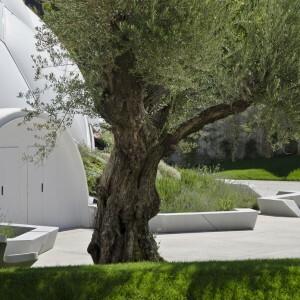 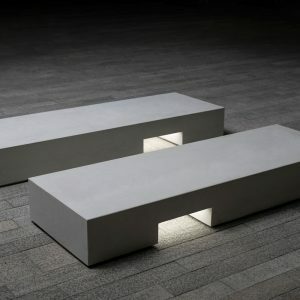 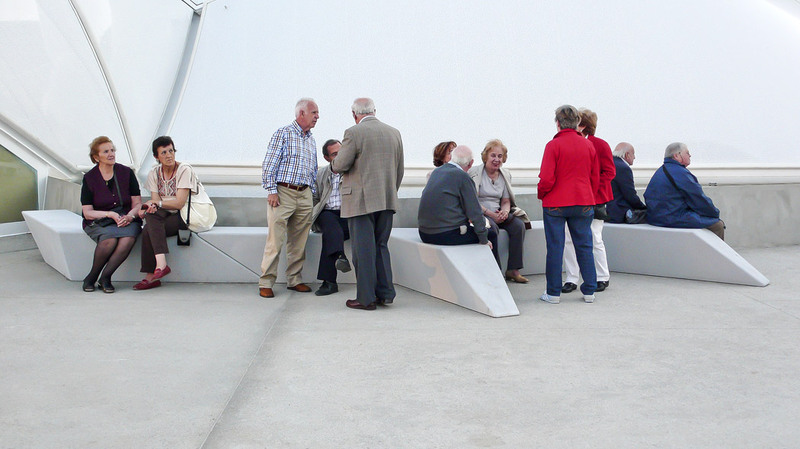 Concrete benches incorporating glass microbeads reflecting the light are disposed around the pavilion, framing gardens and ponds, and identifying the access points. 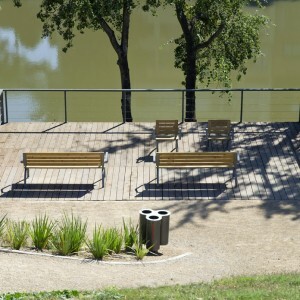 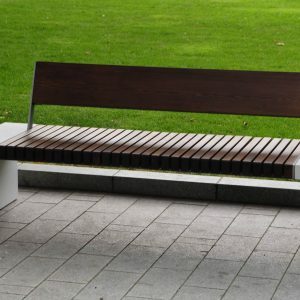 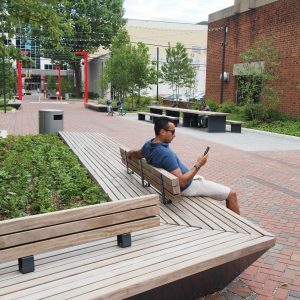 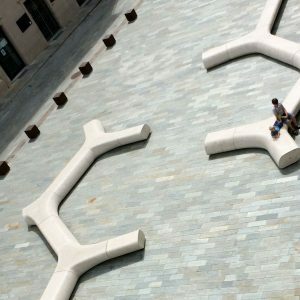 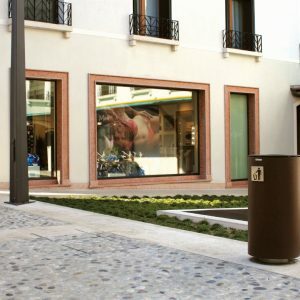 Other autonomous, more domestic, seating devices are installed on the banks and on the square for rest and relaxation. 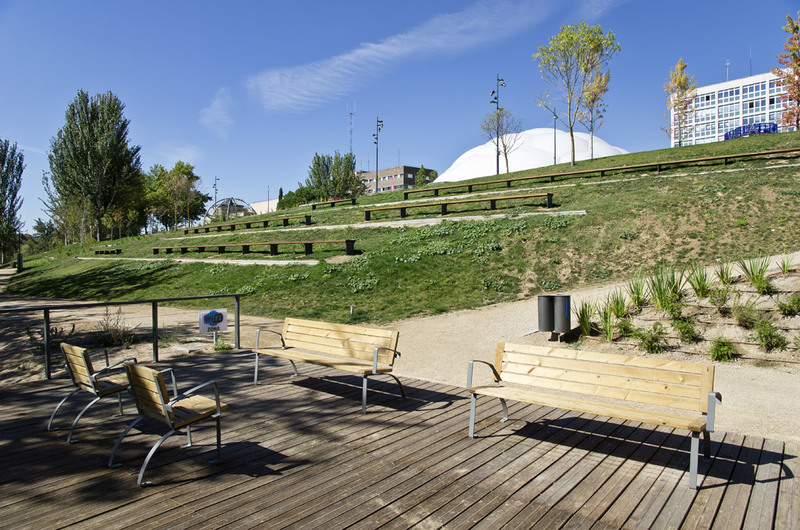 A number of paths allow easy circulation for pedestrians as well as accessibility to the surrounding buildings, to the banks and to the city center. 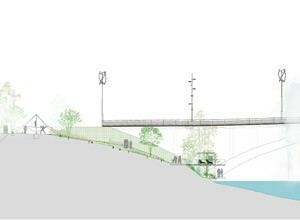 The role of the Isabel the Catholic Bridge is reinforced by a complete upgrade to provide for modern urban needs. 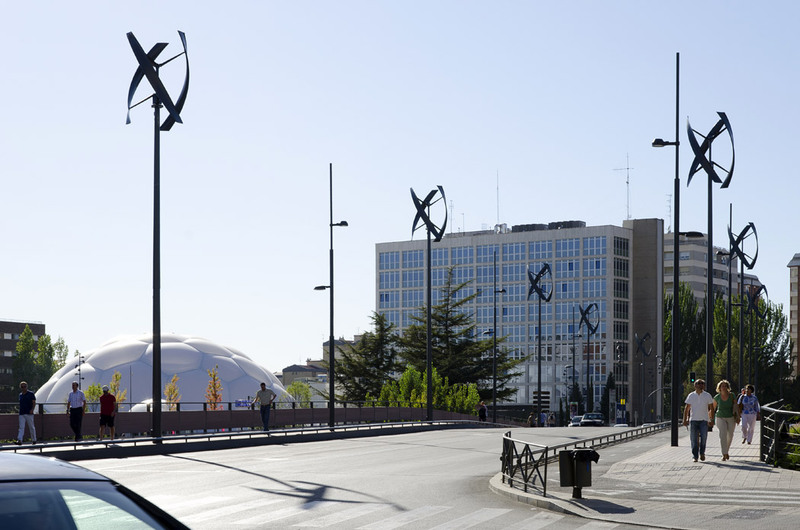 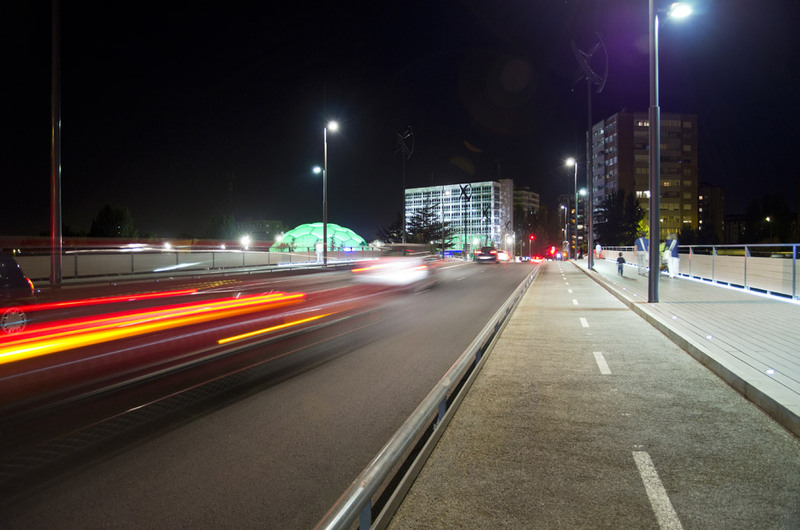 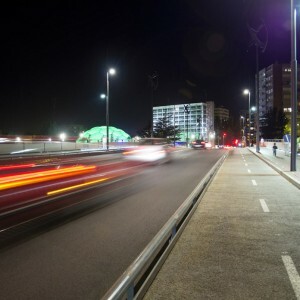 It is equipped with bridges for pedestrians and cyclists, decked in wood, and enhanced by a lighting device system coordinated with that of the square, partly fed by vertical wind turbines and photovoltaic panels fixed to the parapet. 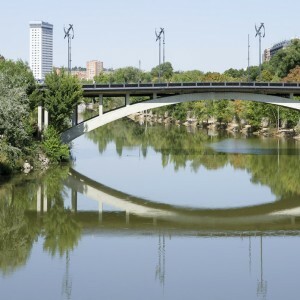 Thus retrofitted, the bridge becomes a full element of the new urban development, constituting part of the energy infrastructure, consistent with the environmental aspirations of the project. 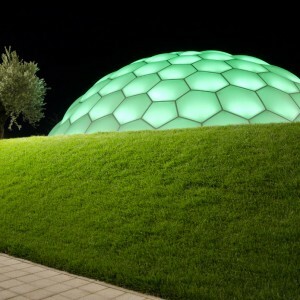 The operation will be certified GBC España – VERDE. 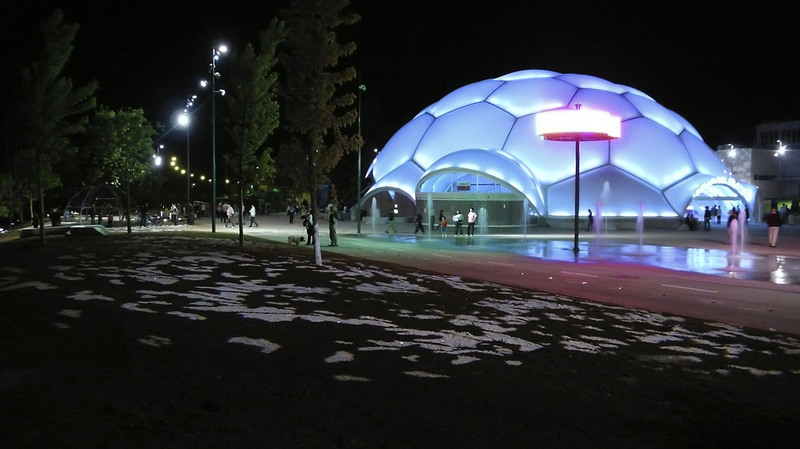 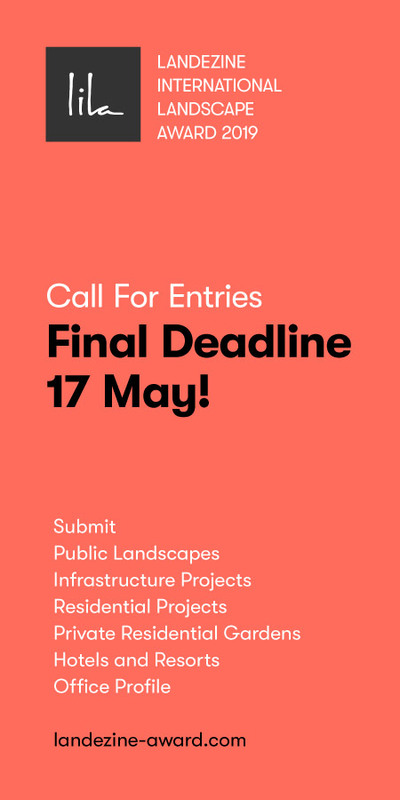 A series of ecological and sustainable processes is featured on the site as a whole: clean construction processes, manufacturing process, recyclable materials, amorphous solar panels, LED lighting system, vertical urban wind turbines, rainwater recycling, planting of rustic native species, recharging terminals for electric vehicles, self-service bikes, etc. 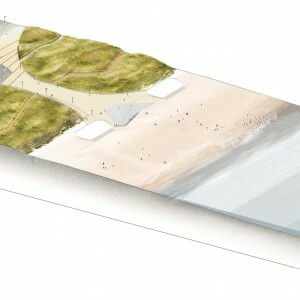 This is a hyper-contextual and sustainable intervention exploiting local resources: climate, water and its management, topography, local plant species, perspectives, renewable energies. 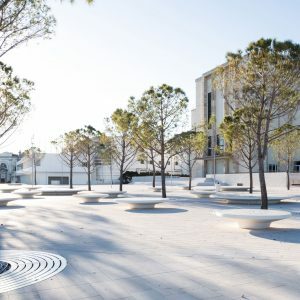 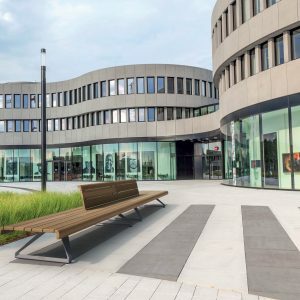 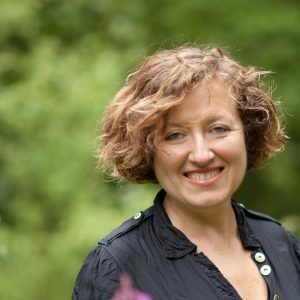 The project is conceived as a multifunctional system, a vibrant, inspiring place, drawing people together, strengthening local identity and enhancing the quality of the environment, all the while providing a capacity for evolutionary change. 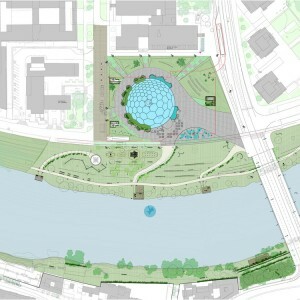 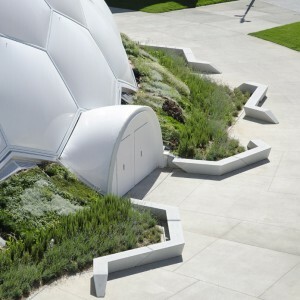 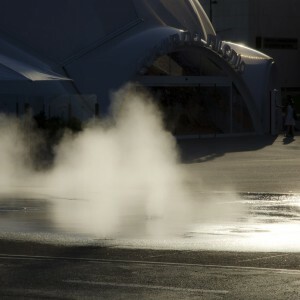 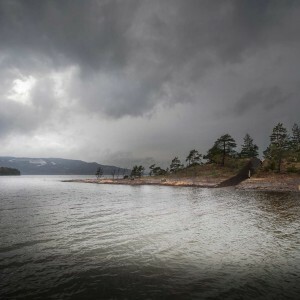 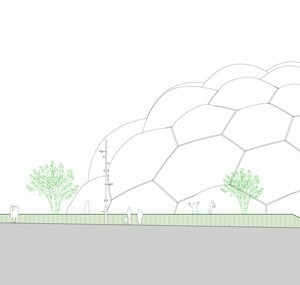 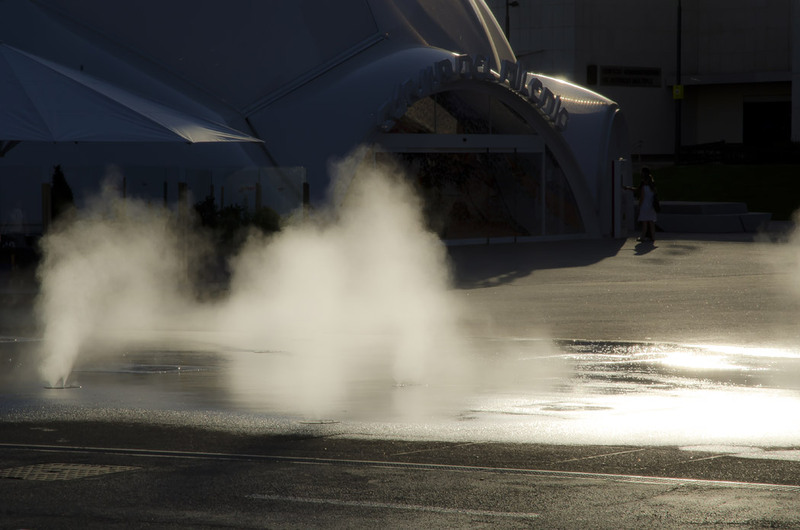 Public spaces and landscape architecture: Concept : EXP ARCHITECTES / Antoine Chassagnol, Nicolas Moskwa, Maxime Vicens. 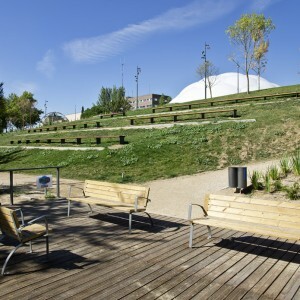 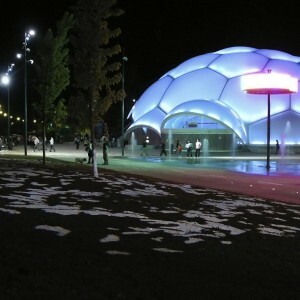 Name :Urban redevelopment of the Plaza del Milenio. 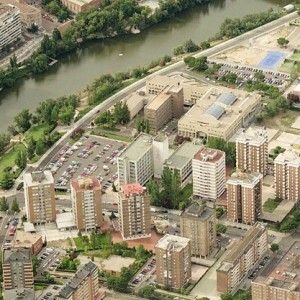 Client: Ayuntamiento de Valladolid, Spain. 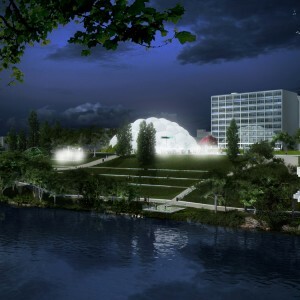 Development : EXP ARCHITECTES and DAD ARQUITECTURA / Sara Delgado Vazquez, Juan Carlos Delgado. 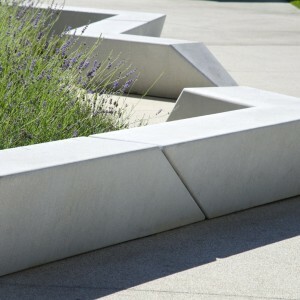 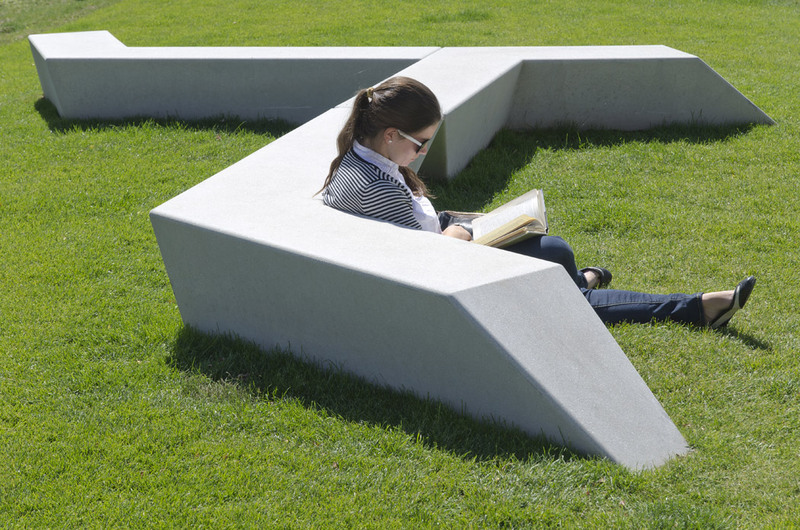 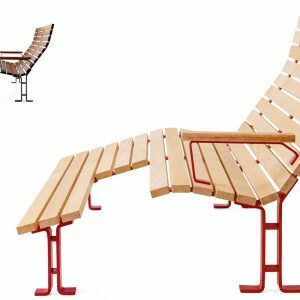 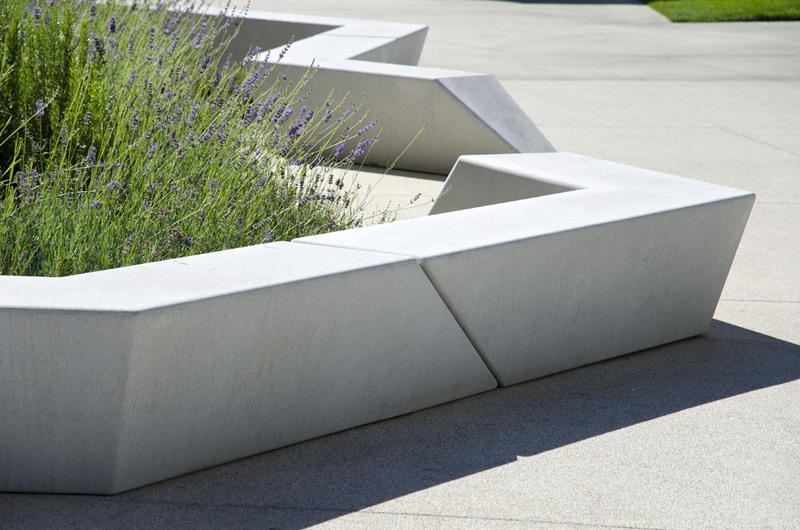 System of modular benches: Design : EXP ARCHITECTES. 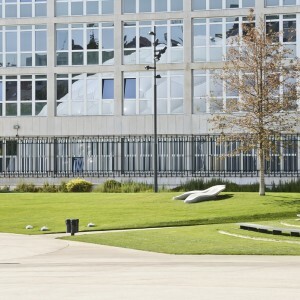 Pavilion: CLOUD 9 / Enric Ruiz Geli with Edouard Cabay. 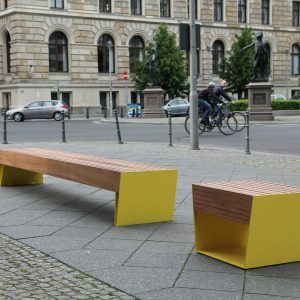 Urban scenography: LES PETITS FRANÇAIS / Martin Arnaud, Marilyn Kuentz. 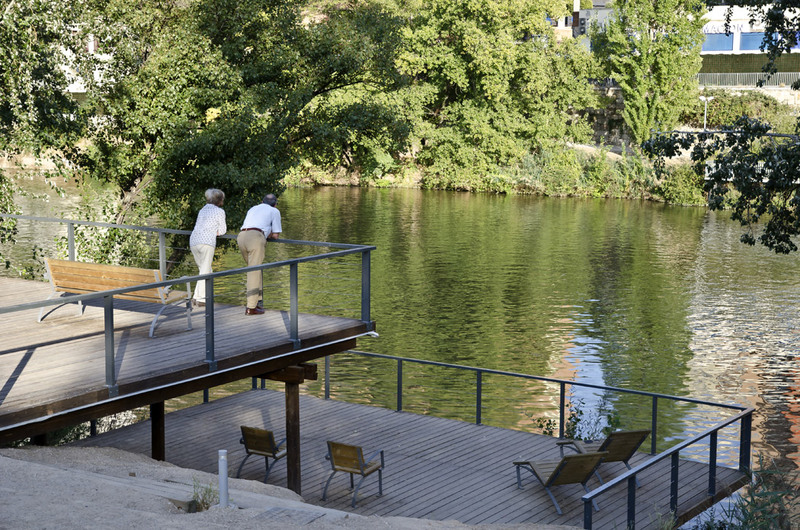 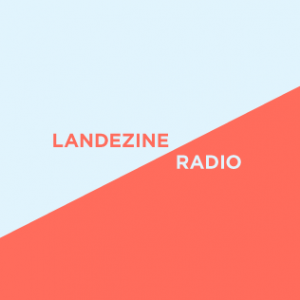 Bridge: EXP ARCHITECTES and DAD ARQUITECTURA.